Reason for Reading: The Evanovich factor. Synopsis: Millionaire Max, cousin of Nick in Full House, rolls into a quiet town (in a talking car, no less) in South Carolina, looking to help his brother-in-law Frankie run a campaign for mayor, and to check up on his unseen partner on the town’s newspaper, Jamie. Upon arrival, Max discovers two things: Jamie is beautiful, intriguing, and fiercely dedicated to a faltering newspaper, but engaged; and Frankie would make an excellent mayor, but a corrupt town council will do almost anything to stop him from getting in and uncovering them. 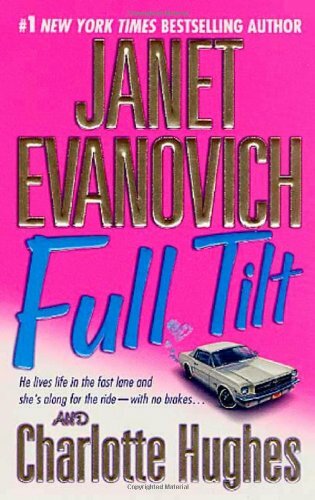 Why you should read this book: A marked improvement on Full House, Full Tilt has much more of the zip and fast-pace that makes Evanovich’s Stephanie Plum series so much fun to read. There’s also a lot more humour than you’d find in a ‘normal’ romance book, and the suspense is interwoven with the story instead of tacked on as in Full House. This is the first in what is to be a series, allowing for an intriguing ending that most romance books don’t permit. Why you should avoid this book: This book is still fairly heavy on the romance factor, and a number of clichÃ©s that come with it, if you don’t enjoy that type of story. Certain factors are blatantly plucked from the Plum series, such as a gun-toting secretary replacing everyone’s favourite gun-toting grandma. He gave her a smile that would melt a woman’s bones. She might be engaged, but she wasn’t blind. Frankie finished pouring the wine and was about to hand Jamie a glass when the window behind them shattered. Deedee screamed. Jamie automatically ducked but not before she caught sight of what appeared to be some kind of fireball It hit the floor, shattering the bottle in which a burning rag had been stuffed. Liquid spewed from the bottle, and the fire flared high and followed what smelled like kerosene across the rug and up the draperies. Also recommended: Lola Carlyle Reveals All by Rachel Gibson; Outlander by Diana Gabaldon; Rachel’s Holiday by Marian Keyes. Also by this author: Motor Mouth; Metro Girl; Hot Stuff; Plum Lovin’; Lean Mean Thirteen; Twelve Sharp; Eleven on Top; Ten Big Ones; To the Nines; Visions of Sugar Plums; Hard Eight; Seven Up; Hot Six; High Five; Four to Score; Three to Get Deadly; Two for the Dough; One for the Money; Full Scoop; Full House; Full Blast; Full Speed; Full Bloom; How I Write; Back to the Bedroom; The Rocky Road to Romance; Love Overboard.